See if you're eligible below! *Offer valid online at vineyardvines.com and at participating retail stores. 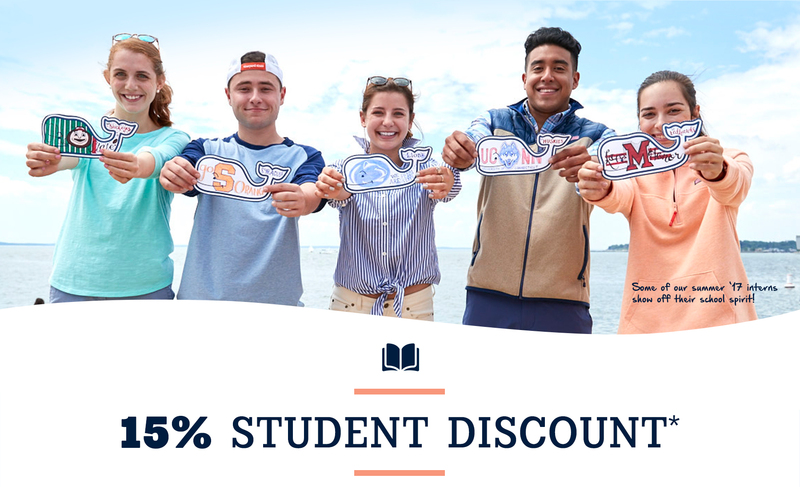 Student discount offered all year at our retail locations. Discount is not valid at vineyard vines outlet locations. Code is valid for one-time use online, or card must be presented in store at checkout. Valid on full-price merchandise only. Cannot be combined with any other offer. vineyard vines reserves the right to change or cancel this promotion at any time. Offer excludes gift cards, Yeti coolers, Titleist®, Costa sunglasses, monogramming & personalization, special collections, and all other third-party products. No price adjustments will be made on previous purchases. Purchases made with this offer are not eligible for future price adjustments. Use of this promotion constitutes acceptance of these terms and conditions, except where prohibited by law. Discount applies to merchandise only and not shipping & handling, taxes, or packaging.